Spencer Harris believes his off-field friendship with Ryan Qualter is helping them perform on the pitch. 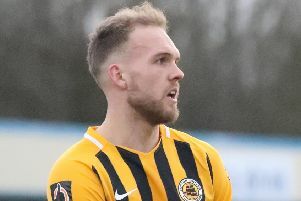 Craig Elliott brought the two former Shaw Lane teammates to the Jakemans Stadium, where they have secured seven wins, including four clean sheets, and a draw in the 13 matches they have played together in central defence this season. “We are good friends and do understand each other well,” said Harris of his travelling companion, adding that their friendship ensures they take nothing to heart on the pitch. “It’s getting stronger each time, it’s good.